This is another one of my mum's favourite pasta dishes. Whenever we had a party this was made for the kids, and it was always loved. I have put it on the entertaining page, but it could easily be on the lunch or dinner page. This is so simple to make, and is just lovely. What I love also is that it can all be assembled earlier (even the day before) and put to bake when needed. I only recently made this for my kids for the first time, they loved it. They took leftovers to school where some of my daughter's friends tried it cold and loved it also. Also if you or your kids like a little spice, I sometimes use a Cherry Tomato Arrabbiata Sauce, which adds a little spice. You can also substitute the frankfurts for equal quantities of cabanossi or cocktail frankfurts. Whatever sausage you prefer. You will need approximately 2 cups of uncooked pasta for the recipe. This is a simple crowd pleasing dish, you have to try it. Heat oil in a large saucepan. Add onion and bacon, saute for 3-4 minutes or until onion is soft. 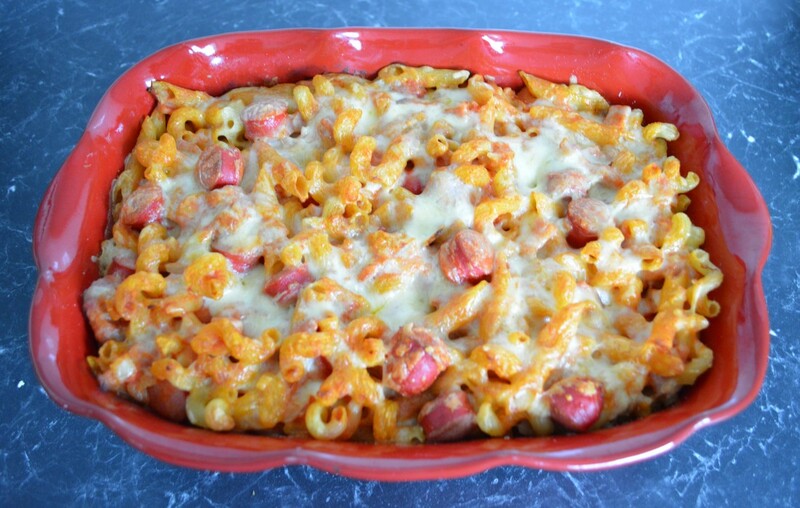 Stir in frankfurts, pasta and cheese. Spoon the mixture into an ovenproof dish. Flatten slightly. Spread sauce evenly over the top of the pasta mixture. Sprinkle with extra cheese. Place a sheet of baking paper over the pasta (this stops the cheese from sticking to the foil), then cover with aluminium foil. Bake for 40-45 minutes or until heated through, uncover for a further 10-15 minutes or until the cheese has melted and is golden.